Thousands of Oklahoma Baptists will soon take part in the 2017 Oklahoma State Missions Offering. The annual offering, promoted by the Baptist General Convention of Oklahoma (BGCO), is focused on one goal—advancing the Gospel in the state. 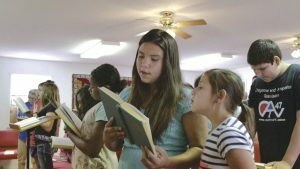 (All Photos) Scenes from videos promoting the Oklahoma State Missions Offering, spotlighting sponsored ministries such as hunger relief efforts, church planting and the Robert Haskins School of Christian Ministry. The Oklahoma State Missions Offering theme is “Mission: Oklahoma.” BGCO Executive Director-Treasurer Anthony L. Jordan believes this theme shows how Oklahoma Baptists can accomplish the mission to reach the lost in Oklahoma. From church revitalization to church planting, from See You at the Pole events to chaplaincy efforts, the offering funds more than 20 vital ministries in this state that are reaching people with the Gospel. As part of the State Missions Offering, packets are being sent to churches across the state that include four promotional videos that were commissioned by the BGCO. The first video focuses on the offering impact overall and theme of “Mission: Oklahoma,” highlighting lostness in Oklahoma and showing how urgent social problems—including addiction, hunger and family breakdown—and sin must be met by the Gospel. The second video focuses on hunger relief efforts made possible through the offering. The video features Chad Clement of Oklahoma City, Mission OKC, a church planter who recognized the growing need of hunger among children in the city. Chad and his wife Anna are able to feed thousands of children who might otherwise go without a meal, using Hunger Funds from the State Missions Offering as a springboard to share the Gospel. The next video shows Chunhai Li, a Chinese pastor who is working to plant a church among the unreached Chinese in Lawton. Through the State Missions Offering, church planters across Oklahoma are equipped and receive strategic support to go reach what has been called the “Hidden Harvest,” or unreached or unnoticed parts of this state. The final video shows the transforming power of Christ in an individual’s life. Emmitt McKenzie never thought he would live to see his 16th birthday. 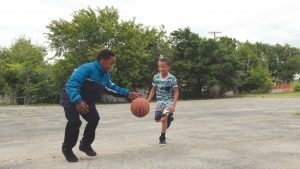 Stuck in a life of crime and gangs, God radically saved Emmitt, who is now receiving training and equipping through the Robert Haskins School of Christian Ministry, which receives State Missions funds. “There is a great urgency to our task, because the number of unreached people in Oklahoma is vast. When you give to the Oklahoma State Missions Offering, you are supporting missions and ministries that help us reach every person and part of this state for Christ,” said Jordan. The Week of Prayer for the State Missions Offering is Sept. 3-9. For more information about the State Missions Offering, visit www.statemissionsok.org or contact the BGCO Women’s Ministry office at 405/942-3800 Ext. 4348.